This brush is self cleaning. Just flip of the snap on top to remove hair. The soft stainless steel pins and foam cushioned pad provide a comfortable grooming experience for your cat. 6-1/2-inch long with pad size of 3-inch x 1-1/2-inch. Can be used on all cats. If you have any questions about this product by Millers Forge, contact us by completing and submitting the form below. If you are looking for a specif part number, please include it with your message. 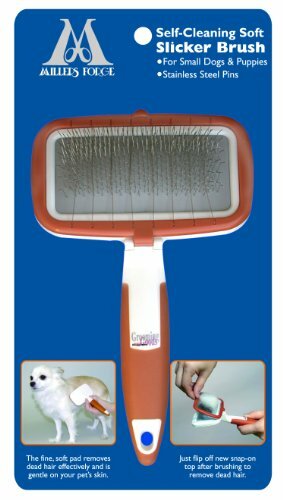 Slicker Dog Cat Grooming Brush - NO.1 For Deshedding Detangling and Dematting Small, Medium and Large Short to Long Hair Pets. Cut Shedding, Massage and Stimulate Healthy Coats.